I can’t belive it! I was just posting the other day that the Turbine Car in the Detroit Historical Collection was in cold storage in Detroit – my email today brought great news! The Gilmore Museum – 6865 Hickory Road, Hickory Corners, MI 49060 has the DHM car now! I don’t know the status of the other cars but I hope they find new homes away from bubbles. Watch for more information as I find out more about the details. We need some help here – $omebody – Plea$e. Now for those of you who don’t know that I love cars – I do. I find it very sad that a situation exists in the Motor City – Detroit Michigan. There is a Museum there called the Detroit Historical Museum. In the past (when we made cars in this country) the car companies really helped out the DHM. Today, they are run by the City of Detroit and funding for the museum keeps shrinking. This effects researchers, and historians a lot but it also has casused a major collection of one-of-a-kind and very unusual cars to be “moth-balled” forever if something is not done about it. 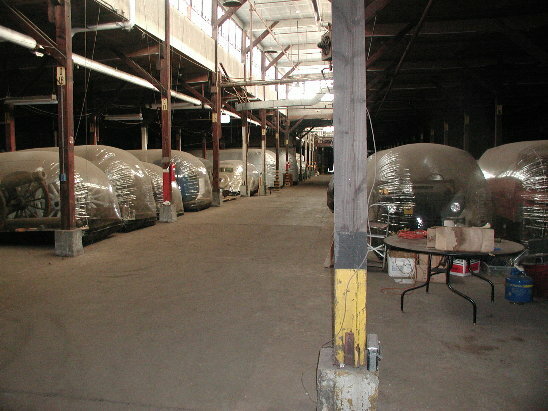 Here is a shot of the storage building that used to store military vehicles – the bubbles help keep the bird dropping off the cars but the building is not a safe place to store all these many beautiful cars. Also they are hidden from public view many of them have not been shown to anyone in over ten years. That is sad. We really need someone to step up and start a project to get these cars into a new home where they will be cared for and displayed so our grandchildren and great grandchildren and beyond will be able to enjoy the boom times of our American auto industry. Jay Leno – if you read this – maybe you can help – anyone else out there that has money to spend on cars at Barrett Jackson – lets start a fund to preserve these cars. I just sat down and watched a very late birthday present from my daughter. She ordered it on-line a month before my birthday – that was over six month ago – just got it Thursday of this week – thanks for the “speedy service” Amazon.com! Anyway – off subject here. The surprise was when I watched the video – I was in it! Well a photo of me and my parents from my web site anyway. The video, by Lance Lambert who does a TV show in Seattle WA. called The VIntage Vehicle Show. Lance visited the Petersen Museum in L.A. – I knew that there was a Chrysler Turbine Car there and that is why I wanted to see the video – I hoped they would show some footage of it. Anyway Lance has one of his “warm and fuzzy” moments remembering growing up in Seattle and seeing one of the Chrysler Turbine Cars near where he lived. Lance then says they were just a typical middle aged couple – My photo is on the screen! Well Lance, I would have liked to know I was going to be used in a TV show – I am still alive you know and then on a DVD too – I don’t mind, I would have just liked a note telling me he was going to do it – I would have asked for a copy of the video – the least he could have done – anyway – it is a good video – if you want to wait a while, they list it at Amazon – or you could go to Lance’s web site – I will not put a link because he did not link to my site – shame on him. But if you search for Lance Lambert vintage vehicle – you will find it. Very good DVD for the car-nut in your family.